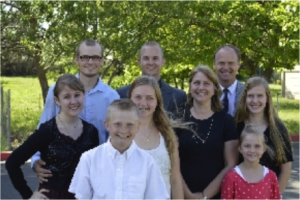 Home Guest Editorials Brian Paddock Farming with Integrity … Organically! How an obsessive almond farmer & his family work hard to grow the best organic almonds you can get. We all know eating raw, organic almonds is the healthiest way to get all the many benefits from almonds. The trick is getting them. Since 2007 all California organic almonds must be pasteurized unless you purchase them directly from the farmer. But pasteurization kills the live enzymes in the nut and significantly degrades the nutritional properties. After we learn the importance of knowing what food to eat, we need to know how our food is grown. I am a certified California organic almond farmer. My family farm grows the finest organic almonds available and we’re happy to tell you how we do it. Throughout history farmers have faced several challenges including weed control, soil health, irrigation and insect and disease control. The first farmers were probably not organic by today’s standards, but they were certainly much closer to organic farming than today’s “conventional farmers.” Sometime around the 1800’s and increasingly after World War II, farmers were attracted to cheap fertilizers made from inorganic chemical compounds. These products seemed to increase yields and lower costs and help the farmer get those challenging aspects under control. While seemingly beneficial in the short term, they had serious longer term side effects such as soil compaction, erosion, and soil infertility, along with health concerns about toxic chemicals entering the food supply. We know all about these drawbacks today so some farmers, like myself, are addressing these concerns by following an organic protocol. For me, it simply makes more sense and all the research backs it up. So who decides what organic farming means? Certainly each farmer can based on their own research. But there is a vast wealth of information out there and it’s helpful if one can reach out to a single source who has the resources to research the product or method to be implemented in an organic farm. In 1990, the Organic Foods Production Act set out to define standard organic farming practices and inputs. Soon the USDA established the National Organic Program (NOP), setting standards and regulations to guide the organic farmer in implementing an appropriate organic process or applying a product to their crops. It also seeks to provide consumers the confidence that their food is grown organically and inspected accordingly. Farmers are not required to be certified organic unless they use the USDA Organic logo. It costs money to be certified, but I believe it is important because it reassures the consumer that the product they are eating was farmed in accordance with the NOP. It also gives confidence to the farmer that they are implementing a sustainable process or material. The USDA oversees many state, non-profit, and private agencies and empowers them to certify organic farms and handlers. Some farmers say they are organic but unless you know them and how they farm, or they are certified, they may not be as “organic” as you think. Certification requires a lot of record keeping and proof of organic practices and inputs. Some farmers are not willing hassle with all the requirements. Also, we do not use synthetic herbicides. Organic herbicides are available, but they are expensive and must be reapplied regularly. How I farm my organic almonds. I can’t tell what other organic farmers do, but here’s how I farm. First, to help block out harmful weeds we plant a beneficial cover crop. Sourcing organic seeds is time consuming and costly. The cover crop is specifically selected to address what the farmer feels are the most important needs, such as adding organic material and nitrogen and aiding weed block, erosion control, etc. For my situation, I primarily need nitrogen. My cover crop is mostly vetch (a type of legume) but I often include clover, radish, or mustard, depending on availability. Legume cover crops fix nitrogen — they take nitrogen out of the air and convert it into a different compound usable by the plant. When the plant dies, the fixed nitrogen is releases making it available to other plants and helping fertilize the soil. Once the cover crop has grown but before it goes to seed (which uses valuable nitrogen), I have sheep mow down my cover crop before it goes to seed. Sheep work well in an orchard, while goats tend to damage the trees. The sheep we use are not vaccinated nor treated with antibiotics. Often, some of the cover crop will re-grow, so we repeat the sheep grazing. Well before harvest, the sheep are removed according to food safety requirements. Then we mow with a tractor and use line trimmers to get anything they did not eat. The sheep also help with soil fertility. The importance of soil health. One area that organic farmers put a lot of focus on is soil health. Just adding nitrogen is not sufficient soil management. The soil needs to be a living home for microorganisms, not just a bank that you pump fertilizers into. Right after harvest we take soil samples to test for about 20 different micronutrients and compounds. Next we spread 300,000 lbs. of organic compost and gypsum plus a little aged horse manure. The purpose of compost is to build soil structure, add nutrients (nitrogen, potassium, etc. ), increase soil water holding capacity, improve soil aeration and cation exchange, supply organic material for beneficial soil organisms, and stabilize soil pH. High soil pH creates a problem where the trees have difficulty absorbing nutrients from the soil. Currently my soil has very high pH levels so I normally add some organic calcium, potash, sulfur, and potassium to lower the pH. Then we till the soil to work in the manure, compost, organic material and cover crop seeds into the ground. With the drought ever-present, this year we decided to inoculate the cover crop seeds with a naturally-occurring, beneficial fungi before planting them. Mycorrhizal fungi are a fungi that form a mutually beneficial symbiotic relationship with the plants’ roots. These fungi attach themselves to the roots, spread to our trees and basically become extensions of the roots. These fungal extensions increase the surface absorbing area of the roots 100 to 1,000 times. Therefore, mycorrhizae increase the trees’ capacity to find and absorb water and even help to break down important nutrients for the health of the tree, such as nitrogen and phosphorus. In spring I’ll take more soil samples to see how our soil is doing. In the summer we inject a liquid form of compost to help with microbial growth, nitrogen uptake and soil stability. The microbial growth is important because the microbes help breakdown insoluble nitrogen and make it available to the trees. At our farm, we work towards organically producing a balanced soil condition containing nutrients and minerals. From leaf samples we can fine tune what minerals the trees may be lacking and add them through foliar sprays. Foliar sprays are very efficient as the open stomata serve as an entry point for these micronutrients. These products are all certified-organic and are mined minerals: sulfur, copper, zinc, magnesium, boron, etc. Each mineral is a critical element to overall health of the tree. Irrigation is another costly expense. Our water comes from a 300 foot-deep well. it’s the same water that our family drinks so it’s very clean and pure. We test it annually for nitrates, e-coli, and a number of other elements. Many farmers use drip irrigation or micro sprinklers to water their orchards these days. We use sub-surface drip, buried 6-8 inches down in the ground. We do this because it is the most efficient method and has virtually no evaporative loss. Also, conventional sprinklers increase the humidity of the orchard and can increase the chance of disease. Another way we maximize our water conservation is by irrigating only when the tree tells us to. How does the tree tell us? We have a pressure chamber, which a UC Davis professor invented. With the pressure chamber we can determine the stem water potential and compare it to a chart. From the chart and evapotranspiration tables we determine the irrigation requirements of the tree. It may be counter-intuitive but it actually doesn’t matter how wet the soil is. We care about is how much water the tree leaves are really getting. With this tool and with our sub-surface drip system we eliminate over-irrigating and use our water resource more efficiently and appropriately. Additionally, we hope the mycorrhizal fungi will help the tree find water. The importance of bees & other beneficial insects. 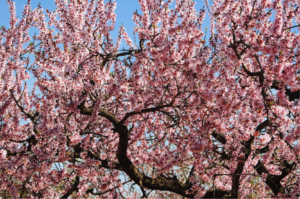 The blossoms of all California almond varieties require cross-pollination with other varieties to produce a crop. 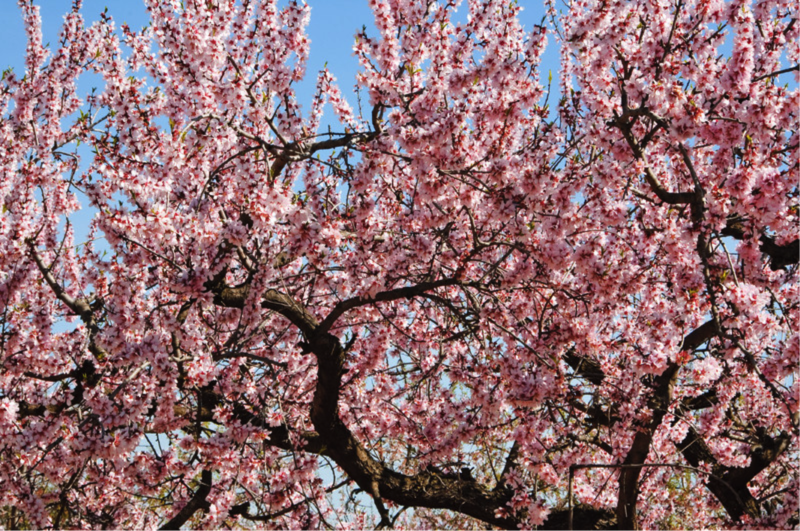 The single most important factor in determining a good yield is pollination during the bloom period (February). Also, without bees we couldn’t farm organic almonds. They are critical to moving the pollen around the 1,400 trees (three varieties). Fortunately, our next-door neighbor is a bee keeper and queen bee breeder of Carniolan and Italian queen bees. 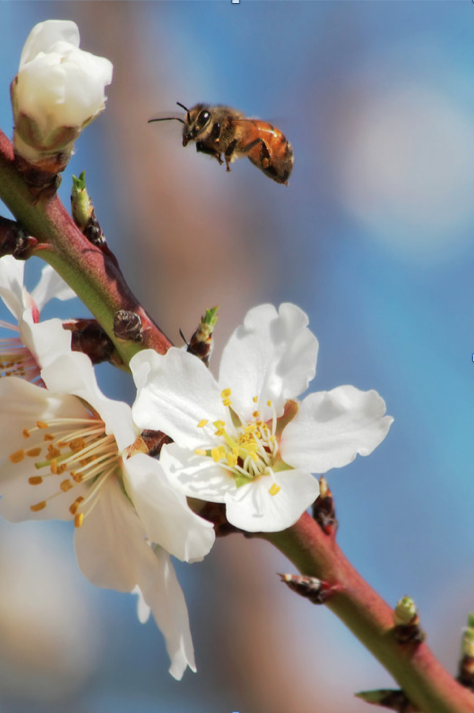 His bees enjoy our orchard and hedgerows year-round. 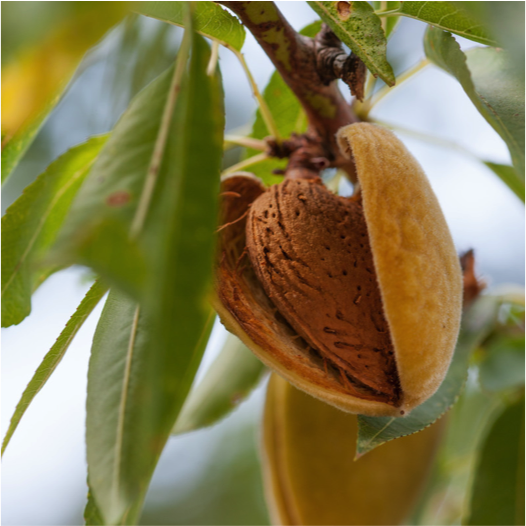 We plant three varieties of almonds (Non-Pareil, Fritz, and Monterey) to maximize cross pollination, production yield, and to ensure a good tasting nut. We maintain 2,500 ft. of hedgerow which provides a natural insectiary for beneficial insects. These insects pollinate the trees and eat bad insects … bug warfare. Wwithout bees we couldn’t farm organic almonds. Years ago farmers ripped out the native plants not realizing they were killing the habitat for the good bugs; hence the bad bugs took over. So when farmers looked for a solution some folks came up with pesticides to eliminate those pesky insects. But, as we learned, non-organic pesticides have longer-term side effects and add to health concerns about toxic chemicals. What we now do instead is provide a nice habitat for beneficial insects. In return they kill the bad insects. Another pest problem we encounter is rodents, such as squirrels. While rodents are not insects, they can be just as damaging to nuts, trunks, and roots. We refrain from using any poisons, so instead we use cats, dogs, traps, and owls to keep these populations under control. At night you can hear our owls near their owl boxes. By the way, they don’t hoot; they screech very loudly. We also provide a habitat in our hedgerows for foxes, which love to eat squirrels. Disease control is another tough battle for organic farmers. So, instead of fighting it after it comes we try to prevent it through organic practices. We have only a few safe weapons to combat disease after infection other than removing the infected tree entirely, although thankfully there are some organic fungicides available. Overall, the best disease management practice is disease prevention — keeping the tree healthy. We do our best to prevent diseases through these methods: (1) Promote open tree canopies for good airflow. (2) Minimize pruning to lessen the number of entries for disease. We also prune only during the right atmospheric conditions. (3) Keep the orchard floor as clean as possible. (4) Don’t over-irrigate and needlessly increase canopy humidity. (5) Plant the trees on mounds to keep the root ball dry. (6) Remove almonds which did not shake loose during harvest. These almonds are called mummies. Harvesting onto tarps…not the ground. The next step is the harvest. We harvest directly onto tarps, which add a food safety layer to our farm. Most almond farmers, even organic almond farmers, just use a machine to shake their trees so the nuts (in the shell and in the husk) drop on the orchard floor. These nuts are then swept up with another machine into rows. The rows, full of nuts, branches, dirt, dust, poop, etc. are then gathered up with another machine similar to a street sweeper. It’s a very dusty, dirty operation and not healthy for either the harvesters or the consumers eating the potentially-contaminated nut. The sweeping process exposes the nuts to soil-borne pathogens — not good. Harvesting onto tarps — not the ground! We use a hydro-mechanical harvester to drop the nuts onto tarps — not the ground! This virtually eliminates any chance of salmonella poisoning because the nuts are not being mixed with the pathogens on the ground. 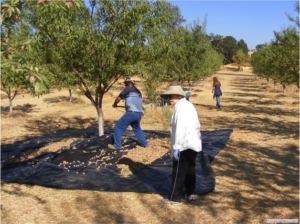 There are very few almond farmers willing to make this extra effort. After the harvest we transport the in-shell, in-hull almonds to a certified-organic local huller and sheller. The almonds come back to us hull-and-shell-free in USDA-approved containers. The almonds are frozen for about 5 days to kill any microscopic insect larvae. We then hand-sort out any insect-damaged almonds. We pack them in boxes and put them in proper cold storage until they are re-packaged according to the customer’s wishes. Finally, we complete the bagging, labeling, and final packing for shipment to the consumer. Well, that’s how I farm. It is a crazy amount of work. We hope you can see that we farm in a very sustainable manner, minimizing the impact we make on God’s creation. A one-ounce, 160-calorie serving of raw almonds, about a handful, is an excellent source of vitamin E and magnesium and an excellent source of fiber. They also offer heart-healthy monounsaturated fat, protein, potassium, calcium, phosphorous and iron. They also offer raw almond butter and naturally smoked organic almonds, a healthy alternative to unhealthy snacks.